Identification: Geographically variable. Upperside is chestnut brown; forewing with 2 brown bars in the cell, no white spots, and no eyespots near the outer margin. Hindwing uppersides are orange with black submarginal spots in one form, and all black in the other form. Life history: Males perch on trees in full sun to watch for females. Eggs are laid in large groups of 200-500 on bark or the underside of mature leaves of host plants. Caterpillars eat leaves and young ones feed gregariously. Third-stage caterpillars hibernate in groups of about 10 inside a dead curled leaf. Flight: One brood in the north from June-August, two broods in the south from March-November. Caterpillar hosts: Trees of the elm family including Celtis occidentalis, C. tenuifolia, C. laevigata, C. lindheimeri, and C. reticulata. Adult food: Tree sap, rotting fruit, dung, carrion. 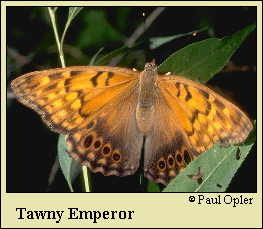 Tawny Emperors almost never visit flowers. Habitat: Densely wooded riparian areas, dry woods, open woods, cities, fencerows, parks. Range: North Dakota south to Texas, east to New England through most of the southeastern states. Isolated populations in Florida, southwest New Mexico, and southeastern Arizona. Conservation: Not usually of ocnservation concern.